A woman wearing Arab-like garb plowed her car into a police cruiser at Miami International Airport on Thursday, screaming “at officers in what was believed to be Arabic,” before saying in English that she had a bomb, according to the Miami Herald. 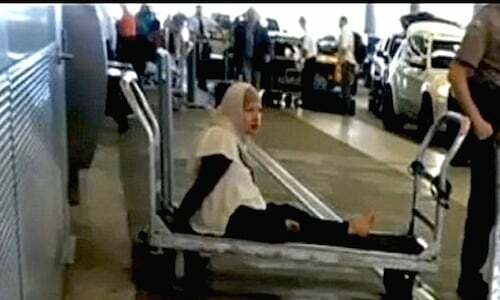 Police handcuffed Honduran national Julissa Magdalena Maradiaga-Iscoa, 33, to a luggage cart outside the airport’s Terminal D, while bomb-sniffing dogs assessed the area, the Herald reported. The woman drove a silver Toyota around the upper concourse and “made a right turn and drove through the inner loop, making an intentional attempt to breach airport security by attempting to drive her vehicle through the airport entrance,” Miami-Dade Detective Alvaro Zabaleta told the Herald. “In a high tone she began to yell in what appeared to be an Arabic language, and then in English told the responding officers that she had a bomb in her possession,” he added. The dogs uncovered no evidence of explosives, and the FBI took Maradiaga-Iscoa into custody. Her bizarre behavior continued at her Friday federal court appearance, where she occasionally interrupted the judge and mumbled “water” and “selfie” throughout the hearing, according to NBC’s Miami affiliate. She was appointed a public defender and ordered held without bond. Maradiaga-Iscoa was deported back to Honduras at least once before. Her next court hearing is scheduled for Mar. 20.